The Iditarod -- an annual long-distance dog sled race and Alaska's most popular sporting event -- kicked off earlier this week, and will end sometime in the next week, when the first team of huskies crosses the finish line in Nome. The competition has been called the last great race on earth, covering approximately 1,000 miles of arctic tundra and often placing mushers and their dogs in relentless, white-out blizzard conditions. It is meant to test the limits of every man, woman, and dog who participates. As a result, the race has drawn criticism as harsh as the conditions under which it takes place. But while some, citing concerns about the dogs' welfare, claim that the race is cruel, others herald the Iditarod as a unique celebration of the bond between people and animals. We've gathered several of those opinions here from some of our favorite experts -- some of whom have agreed to disagree about the merits and morals of this controversial race. We hope you'll go read them: Journalist Mark Derr explains how seeing the race in person has made him look forward to it each year, while his friend, the renowned ethologist Marc Bekoff, believes the race needlessly causes numerous dogs' deaths. 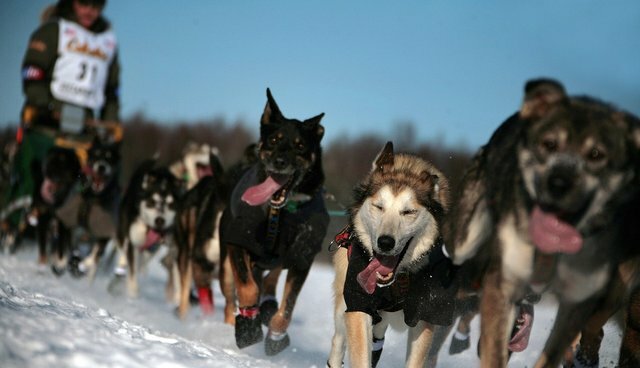 Canine researcher Julie Hecht cites new scientific research into the optimization of the well-being and performance of working dogs, and hopes that those involved in the Iditarod will join in the effort to improve dog welfare. Hal Herzog, author of "Some We Love, Some We Hate, Some We Eat," compares dog sledding to horse racing, asking which is more ethically problematic. Bioethicist Jessica Pierce reflects on her own experience dog sledding and wrestles with the question of whether the Iditarod is sport, or closer to a form of exploitation. Finally, Stephen Wells, director of the Animal Legal Defense Fund, comes out strongly against the Iditarod, sharing how he rescued dogs dumped because they were deemed unfit to race.